Also known as temptation melons, honeydew melons are thought to have their roots in West Africa and have been cultivated for over 4,000 years. So, what is a honeydew melon? Keep reading to learn more. Akin to its popular relative the cantaloupe, honeydew melons are members of the cucurbit or gourd family along with cucumbers and squash. One of the sweetest melons, honeydews are high in vitamin C and potassium. Honeydews are eaten fresh for their succulent sugary pale green flesh. The peel may be pickled or cooked, or the seeds may be pressed for oil or roasted and dried. In appearance the honeydew melon is oval to round with a smooth creamy yellow rind that is peeled to reveal the aromatic pale green interior. These melons weigh about 4-8 pounds and grow upon a vine which produces three to four melons. 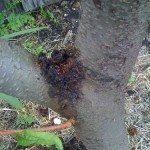 In years past, growing honeydew has been challenging for both the home gardener and commercial farmer due to its propensity to downy and powdery mildew and attractiveness to a variety of insects. Today, varieties such as ‘Floridew,’ ‘Morgan,’ ‘Earlidew,’ and ‘Tamdew’ are resistant to most fungal diseases. Once you have selected the seeds or seedlings for the variety you wish to grow, the question remains, “How to grow a honeydew melon?” Honeydews may be grown in a large pot or the garden. If you’re starting from seed, fill peat moss pots with either potting soil or compost and place one seed into each about ½ inch into the soil, then place the little pots in a shallow plastic tray. Fill the tray up to an inch high with water mixed with soluble fertilizer and put it in a room between 70-90 F. (21-23 C.) to germinate. Continue to add water when necessary. The seeds will sprout in about two weeks but you should continue to grow inside until the plant has at least two leaves. Transplant honeydew into the garden once the soil is at least 65 F. (18 C.) and water in thoroughly. Surround the transplant with mulch to retard weed growth and retain water. Once the honeydew fruit has attained a smooth evenly colored skin after three months, harvesting honeydew melons may commence. How do you pick honeydew then? It must be cut from the plant, as it does not slip easily from the vine as do most melons. When is Honeydew Melon Ripe? Since easy removal from the vine is no indicator, how do you tell when honeydew is ripe enough for harvesting honeydew melons? The indicators for when to begin harvesting honeydew melons are size, skin color (completely white or yellow) and smoothness, and the timing of about three months after planting. The fruit will indeed be hard and although mature, very probably not ripe. So when then is honeydew melon ripe? Honeydews can be ripened at room temp over the course of a few days. Leave out on the counter or place in a plastic bag along with tomatoes or apples, which will emit ethylene and hasten the ripening process. Once ripe, the whole melon will keep for a week in the refrigerator but once cut into it should be eaten within a few days. Cut melon tends to absorb odors from the fridge.